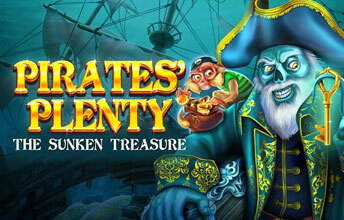 Pirates’ Plenty is a slot from Red Tiger Gaming although you really wouldn’t guess that. It’s a fairly radical departure from their usual Asian fayer. This game is multi-faceted with achievements, free spins, multiple wilds, stacked wilds and a heck of a lot of potential. You won’t need a pirate’s spyglass to spot that there’s a 6th reel here. You really want to unlock that reel. You get the 6th reel by reaching Pirate Island. Every time a treasure Map appears on the reels your ship will sail a little closer to the island. In our run through this took us about 400 spins but we were unlucky and it should take about 150 on average we’re told. If you need to take a break from the high seas don’t worry your progress will be saved for 12 days. Once you unlock the 6th reel it stays unlocked. 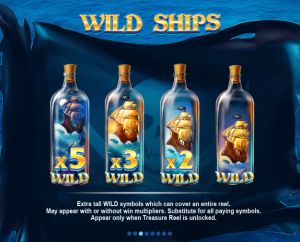 The Pirate’s Plenty base game features stacked wilds (in the form of a ship in a bottle) these can appear on every reel once the 6th reel is open and they can contain multipliers. 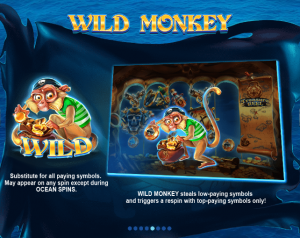 A ship’s monkey ( I thought they had cats, this must be a proper top Pirate) will appear occasionally and remove all of the low paying symbols from the reels for one spin. 3 or more scatters will trigger the bonus game. During the bonus rounds a ghostly pirate will appear on the screen, every time a ghost pirate pops up he carries a key and will unlock one of 3 locks on each chest. Each chest then grants additional spins and wild symbols. 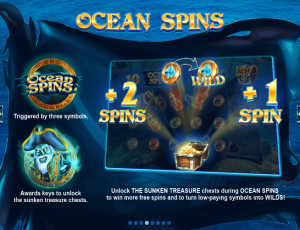 Up to 6 ghostly pirates can appear at once so don’t lose hope and throw yourself overboard if you’re down to your last couple of spins. There’s plenty of potential in this game and it opens up Red Tiger to an entirely different audience. Now, where did I leave my bottle of Rum? We played Pirate’s Plenty at Wishmaker whom we highly recommend but you’ll find it pretty much anywhere.